As light hits a plane it creates a value. This is the relative degree of light or shadow on the form. Value changes as a plane is in less or more direct influence of the light source. So, a plane that is turned at a 45 degree angle to the light source receives less light than one that is at a 90 degree angle and, consequently, is lighter because it receives more direct light. Value changes often occur gradually. If you look at the object in the lower left corner of the diagram, you will notice that the relative percentages of black increase as the plane gets further from the light. These changes occur on any object. Even if we are looking at a white object, it will have a number of subtle value changes and would be drawn with only a small amount of pure white. This would occur only at the points most directly hit by the light. Hint: The background color and any plane adjacent to the object being drawn, will influence the value of the form being rendered. 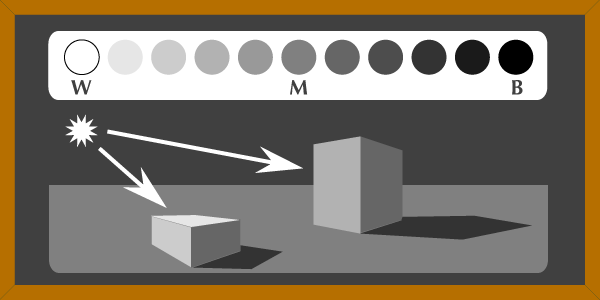 It is important to consider the background value with the object being drawn because it will directly influence decisions in the drawing. Sometimes an artist controls gray value to give a drawing the appearance of solidity. 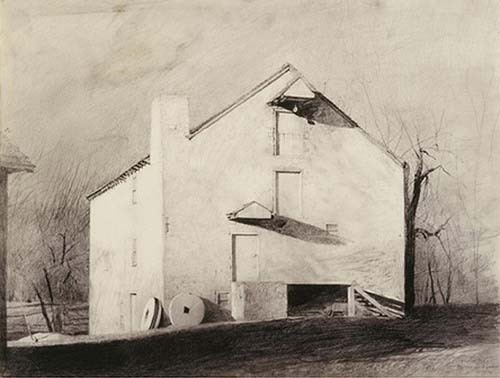 A good example of this occurs in Andrew Wyeth's Brinton's Mill, Study for Night Sleeper from 1979.